Learn the Parts of the Computer in 3 easy steps!1. 1. Do you know the parts of the computer? Let's play a game! Let's play Mrs. Bloom says. Rules: Sit at your assigned computer and wait for Mrs. Bloom to say "Mrs. Bloom says point to a...(part of the computer)" and point to the part that she is asking for! If she asks you to point to a part that is not a computer part or piece of technology, and you do you are out! Let's see how many you can get right! Ready? 2. Next, let's watch this video to learn more! What else do you know about computers? What about laptops, tablets, smartphones? 3. Complete the Computer Parts Worksheet! 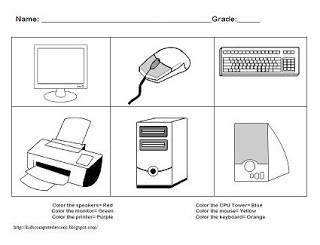 ﻿You will put your expertise to the test by completing the computer parts worksheet by coloring and labeling the parts of the computer. Computer, Tablet, Laptop, Monitor, Keyboard, Mouse, CPU, Tower, Printer, Server, Network, Speakers. 3. 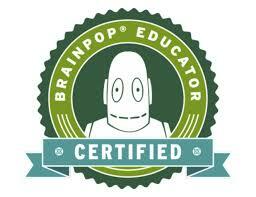 Research and information fluency- Students apply digital tools to gather, evaluate, and use information.